Tooth and Claw originally aired in 2006. I want her to say “we are not amused.” I bet you five quid I can make her say it. Well, if I gambled on that, it’d be an abuse of my privileges of traveller in time. There’s something quite interesting at the heart of Tooth and Claw, which might be the best “historical celebrity + monster” mash-up of the Davies era. It’s a wonderful pulpy genre hybrid run-around with Queen Victoria, ninja monks and a werewolf, but it’s also a quite interesting vehicle to explore the way that the show deals with historical characters. After all, Queen Victoria is a British icon, a monumentally important part of the British Empire. It would be tempting to reduce her to a bunch of catch-phrases and a stiff upper lip. It’s a testament to Davies as a writer that he can flesh her out a fully-drawn character. However, there does seem to be something quite strange about a show that opens with a cheap shot at Margaret Thatcher only to wallow in the iconic status of Queen Victoria. I feel the need to clarify that I am a major fan of the Davies era. It’s what drew me into the show, and I honestly think that it stands as one of the creative highlights of Doctor Who as a cultural phenomenon. There’s really no way to stress how incredibly important Davies’ vision was to making the show so massively popular. And I also think that Tooth and Claw is pretty close to the perfect example of a Davies-era script. It’s smart, it’s funny, it’s well-paced and it’s fun. It’s very well-made and enjoyable television. However, it’s also packed with contradictions – that fact that it can reconcile them at all is just to Davies’ credit. Doctor Who is often a bit political. In fact, it’s often a lot more predictable than family television gets to be. I suspect part of that is down to the fact that it’s about an alien travelling through time inside a phone box (or police call box, if you want to be pedantic). Whether it’s the blatant anti-Thatcher subtext of the late eighties, or the weird establishment-yet-new-age feeling in the early seventies, the show tends to get away with making all manner of interesting political suggestions. Davies’ Doctor Who is no different. Davies tends to get attacked on the grounds of sexuality, which is just nonsense, really. Being honest, I’m actually very disappointed that we live in a world where pointing out that sometimes people love other people in ways that don’t conform to social norms can be considered having an “agenda.” It’s something that really irks me, and I think it’s reductive to focus on Russell T. Davies’ sexuality as if that’s somehow the be-all and end-all of his subtext in Doctor Who. It’s not subtext, and it shouldn’t ever be. But I’ll get off my own soap box, because you’re here for the Doctor Who review. Unless you’re not. In which case I’m sorry. I’m so sorry. Davies’ Doctor Who is very politically conscious, and very aware of the notion of social justice and social class in society. Davies tends to embrace a vaguely socialist philosophy in his Doctor Who. This is most obvious in his “New Earth” cycle of stories that concern – in order – rich people paying to watch an expensive firework’s display while being all racist and classist, private healthcare, and the time spent commuting. However, it is a very clear thematic through-line in his Doctor Who, and not just in his writing. At its most preachy, in Rise of the Cybermen, it seems to suggest that being rich makes you evil. It’s telling that his “Daleks in New York” adventure also took the time to focus on the Great Depression and the exploitation of the poor workers building the skyscrapers and the other important markers of human accomplishment. 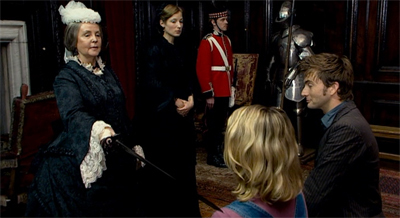 It feels weird, then, for the Doctor to make flippant remarks about Sir Robert’s sexuality in front the monarch who insisted on a medical exam to prove that Lady Flora Hastings was still a virgin. “Did you think there was nothing strange about my household staff?” Sire Robert asks. “Well,” the Doctor replies, “they were bald, athletic. Your wife’s away, I just thought you were happy.” It’s a witty line, but it feels strange that the Queen should not react to the insinuation at all. Of course, that would force the episode to deal with the fact that it is forcing a bit of a round peg into a square hole here. 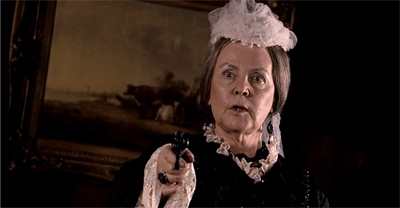 Of course, Doctor Who isn’t strictly interested in the facts of the life of Queen Victoria. If we wanted those, we’d be watching the Biography Channel instead of an episode about the Doctor and Rose and Queen Victoria and a Werewolf, but it illustrates the complications that the show can generate. There’s no way that the show would be comfortable with Queen Victoria’ politics. However, if this is going to be an adventure show featuring trips into the past, the series is going to have to get through that. After all, trips to the past are going to involve dealing with heroic characters with less than progressive outlooks. The difficulty arises when the show decides to take a staunchly conservative icon and build an adventure around her. It’s hard to get the sense that the show isn’t somehow reducing Queen Victoria into a piece of British pop culture (like “Britannica”, except as a British form of “Americana” rather than… you know, the encyclopaedia), rather than dealing with her within something approaching the context of her time. It feels a bit like “theme park history”, which is a very risky way to look at the past. It’s an interesting discussion, the weight of the show’s politics as against the expectations of a fun science-fiction adventure show. It came up again when the liberal show decided to film Planet of the Dead in the decidedly homophobic Dubai. It’s a very tough tightrope for the show to walk, and I think that Davies managed it quite well, broadly speaking. Still, there are one or two thorny questions raised, and Tooth and Claw brushes against one of them. Queen Victoria’s conservative politics are apparently washed away by nostalgia or by the passage of time. Does that mean that we might see an adventure in thirty or forty years time that teams up the Doctor with a Margaret Thatcher fighting zombies in Westminster? It would feel weird now, but does it risk undermining the other interesting political points that the show is trying to make? I don’t know, but I do think about it. In fact, Tooth and Claw is one of Davies’ best scripts, because it’s so remarkably straight-forward. 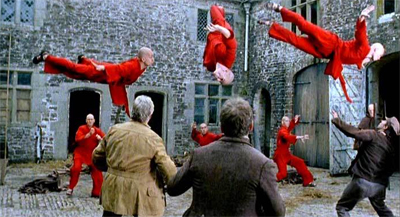 It’s a run-around with some wonderful character work, a collection of tropes and clichés seemingly pulled from everywhere in order to fashion a pulpy narrative framework for what amounts to a werewolf movie with ninja monks and Queen Victoria. It’s a great high concept, and Davies seems to have had a great deal of fun with it. 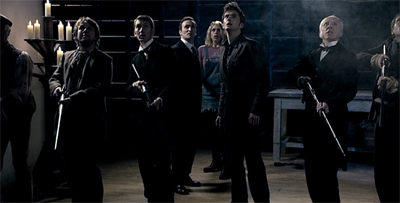 The story also briefly touches on the events of The Parting of the Ways. Since Rose woke up in the TARDIS, it hasn’t been clear how much she remembers of the experience. “There is something of the wolf about you,” the creature comments. Rose is somewhat flustered by the comment. “I don’t know what you mean.” It’s unclear whether or not she remembers having the time vortex inside her head. She does, though clearly remember the events in Doomsday. I’ll confess to being a bit disappointed that the show never properly dealt with that. But it’s hardly a massive missing link. Euros Lyn’s direction is fantastic, and while the CGI werewolf isn’t flawless, it’s a fantastic effect for a BBC production. Tooth and Claw has a genuine sense of horror, despite the fact that it is family entertainment, and there’s a palpable sense that this isn’t the fun run-around that Rose and the Tenth Doctor seem to think that it is. In a way, it feels like a bigger budget throwback to the Hammer Horror aesthetic of the Hinchcliffe era, only with better production values than Hammer Horror. It also showcases Tennant a lot better than either of his two previous episodes. 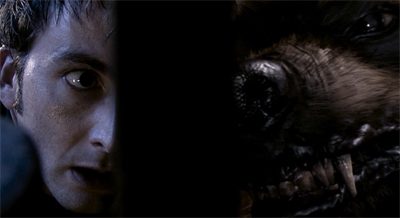 Tennant settled into the role remarkably quickly, and Tooth and Claw pretty much captures the Tenth Doctor perfectly. None of that weird “no second chances” milarky, just – to quote the Fifth Doctor – “some skinny idiot ranting in my face about every single thing that happens to be in front of him.” The Tenth Doctor is the perfect historical tourist, the kind of geek who gets a kick out seeing all these familiar concepts and characters in motion. The Tenth Doctor is, in his purest form, a Doctor Who fan in the persona of the Doctor. He loves the travel, the plot devices, the celebrities, the clichés, the monsters. Indeed, this explains why Tennant is so perfectly cast. Eccleston was a much stronger actor than Tennant, who isn’t half bad, but Tennant seems far more comfortable in the role. Even in Rose it was difficult to imagine Eccleston staying more than two years in the TARDIS. By the time we’ve reached Tooth and Claw, it’s clear we’re going to have to pry Tennant out with a crowbar. To be fair, there’s nothing wrong with that. After all, the TARDIS drops the Doctor and his companions into danger with enough frequency that they have certainly earned an occasional breather. But there’s just something so smugly casual about that line and the way that is delivered. Again, it’s clear that Davies intends this. He writes Rose and the Tenth Doctor as decidedly more smug and arrogant, as a way of foreshadowing their initial separation. 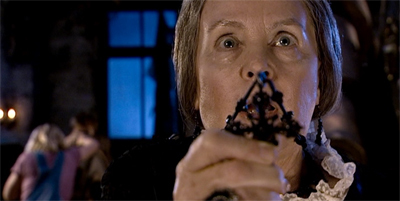 “It’s deliberate when that happens,” said head writer Russell T Davies, “and they do pay the price. 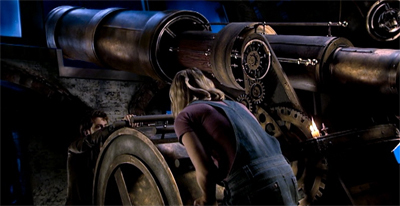 In “Tooth and Claw”, they set up the very thing — Torchwood — that separates them in the end. It’s sort of their own fault. That doesn’t make it any less annoying to watch, though. It’s also nice to see the show making a stronger effort at a year-long story arc. “Bad Wolf” was a nice enough attempt on the first time around, but it felt a little convenient and simplistic that it stemmed from the final episodes backwards, rather than developing logically. Davies does take advantage of the time-travel nature of the show for his first three year-long arcs, but the “Torchwood” arc arguably feels the best developed of these, seen as it’s more up-front with the audience. Davies clues us into what Torchwood is and what it is planning for fairly quickly after we first notice the word being dropped into scripts, which feels a bit shrewder than the approach with “Bad Wolf” of “Mister Saxon”, which are really just words peppered through the season without any meaning or context. (After all, which “Mister Saxon” is an anagram of “Master No. Six”, it’s not as if the audience could piece that much together with the evidence provided.) Explicitly showing the foundation of Torchwood is a nice way of demonstrating the Doctor’s hubris here. We’re actually aware of the consequences of his actions before he is. 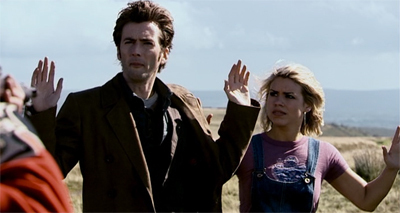 Still, Tooth and Claw at least acknowledges how annoying Rose and the Tenth Doctor can be together, which is something. And it’s a pretty damn fine blend of the classic “historical monster” and “base under siege” templates. It’s a fun, pulpy adventure and one of the stronger stories from a rocky second season.